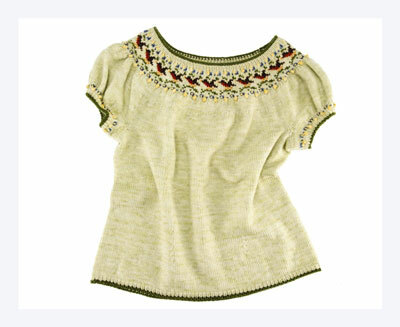 The shallow yoke and gathered sleeves of this top knitted using stranded colorwork are accented with two different sizes of bobbles, as well as embroidered French knots. Gentle waist shaping and ribbing with contrasting tipped edges complete the look. CC1: Saffron Surprise, 20 yd. CC2: Midsummers Night, 20 yd. CC3: The Green That Sings, 50 yd. CC4: Sun Stone, 20 yd. CC5: Muckity Muck, 20 yd. CC6: Meet Brown, Joe, 20 yd. 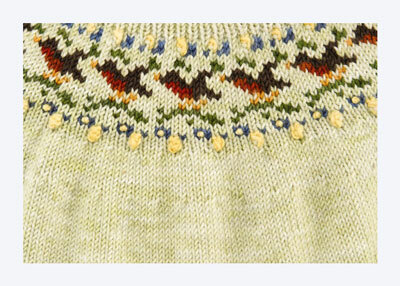 Size 6 (4mm) 16″ and 24″ circulars, and double-pointed needles, or size needed to achieve gauge. 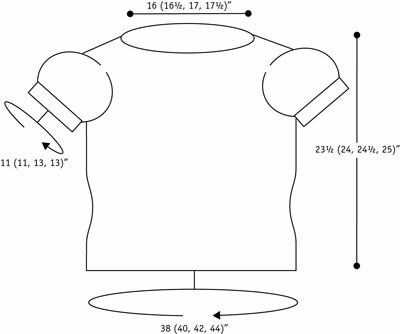 MB 1 (make large bobble): Knit into f, b, f of next st (make 3 sts from 1). Pass 3 sts back to left needle. K3. Pass 2nd and 3rd sts over 1st st.
MB 2 (make small bobble): Knit into f & b of next st (make 2 sts from 1). Pass 2 sts back to left needle. K2. Pass 2nd st over 1st st.
With larger 24″ circular needle and CC3, CO 230 (240, 250, 270) sts. PM and join for working in rnds, being careful not to twist sts. 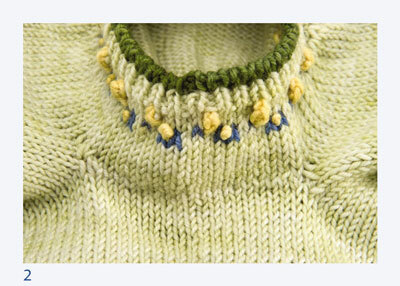 Knit 2 rnds in k1, p1 rib. Change to MC and knit 1 rnd. Work 3 rnds in k1, p1 rib. Work in St st until piece measures 3-1⁄2 (4, 4-1⁄2, 5)” from beg. PM for waist shaping darts (shown at right) as follows: K38 (40, 41, 45), PM, k39 (40, 43, 45), PM, k76 (80, 82, 90), PM, k39 (40, 43, 45), PM, knit to end of rnd. 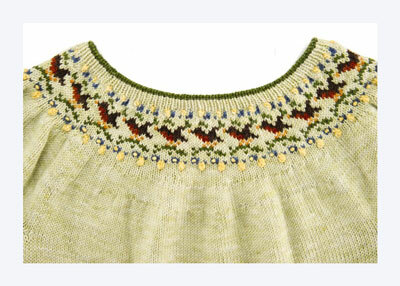 Next rnd: Work dec as foll: *Knit to last 2 sts before M, ssk, slip M. Knit to M, slip M, k2tog. 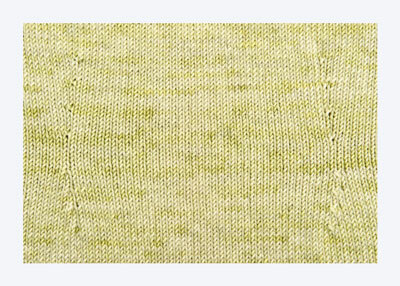 Knit to last 2 sts before M, ssk, slip M. Knit to M, slip M, k2tog. Knit to end of rnd. Rep from * every 4th rnd, 3 more times — 214 (224, 234, 254) sts. Work even for 8 rnds. Next rnd: Work inc as follows: *Knit to M, M1R, slip M. Knit to M, slip M, M1L. Knit to M, M1R, slip M. Knit to M, slip M, M1L. Knit to end of rnd. Rep from * every 6th rnd 3 more times — 230 (240, 250, 270) sts. Work even until piece measures 14-1⁄2 (15, 15-1⁄2, 16)” from beg. Place 18 (18, 20, 22) sts at each side of body on holders for underarms — 194 (204, 210, 226) sts. With smaller DPNs and CC3, CO 70 (70, 80, 80) sts. Work 2 rnds in k1, p1 rib. Change to MC and knit 1 rnd. Work 3 rnds in k1, p1 rib. Change to larger DPNs and work rows 1–5 of sleeve chart. 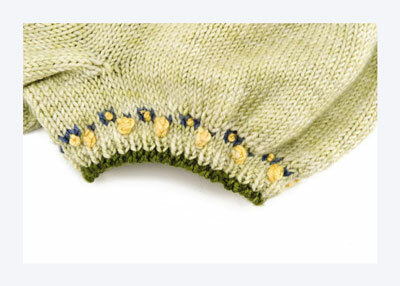 Next rnd — work lower sleeve gathers: K15, knit into f & b of next 40 (40, 50, 50) sts, k15 — 110 (110, 130, 130) sts. Work even until piece measures 1-1⁄2 (2, 2-1⁄2, 3)” from beg. Place 18 (18, 20, 22) underarm sts on holders — 92 (92, 110, 110) sts. Beg with left sleeve, rejoin working yarn and work from 1st st adjoining holder around to last using larger 24″ circular needle. Continue working all sts of body front onto same needle. When you reach 2nd set of held underarm sts on body, add 2nd sleeve by working all sts from one side of held sleeve sts to the other. Work rem body sts onto same needle, PM at end of row — 378 (388, 430, 442) sts. Work even until body measures 17-1⁄2 (18, 18-1⁄2, 19)” from beg. Next rnd: PM on either side of 76 (80, 86, 88) center sleeve sts — 113 (114, 129, 133) body sts between markers. K76 (80, 86, 88) sleeve sts. *K3, k2tog. Rep from * 21 (21, 24, 25) more times to last 3 (4, 4, 3) sts before M, k3 (4, 4, 3), slip M. K76 (80, 86, 88) sts. *K3, k2tog. Rep from * 21 (21, 24, 25) more times to last 3 (4, 0, 3) sts before M, k3 (4, 4, 3), slip M. 91 (92, 104, 107) body sts between markers. This set of decreases is worked on the body stitches only. Work even until piece measures 18-1⁄2 (19, 19-1⁄2, 20)” from beg. First sleeve: Slip M, k2tog 38 (40, 43, 44) times — 38 (40, 43, 44) sleeve sts. Front: Slip M, *k2, k2tog. Rep from * to last 7 (4, 8, 3) sts. k2tog 3 (0, 3, 0) times K1 (4, 2, 3) — 67 (70, 77, 81) front body sts. Second sleeve: Work same as first sleeve — 38 (40, 43, 44) sleeve sts. Back: Work same as Front — 67 (70, 77, 81) back body sts. Total amount of yoke sts — 210 (220, 240, 250) sts. Turn work. Sl1, p39 (41, 43, 45). Turn work. Sl1, k11 (13, 15, 17). Turn work. Sl1, p25 (27, 29, 31). Turn work. Sl1, k39 (41, 43, 45). Turn work. Sl1, p53 (55, 57, 59). Turn work. Sl1, knit to beg of rnd. Neatening rnd: Knit. As you come to each previously slipped st, pick up the st in the row beneath it and place it back on left needle. Knit it and the slipped st together. 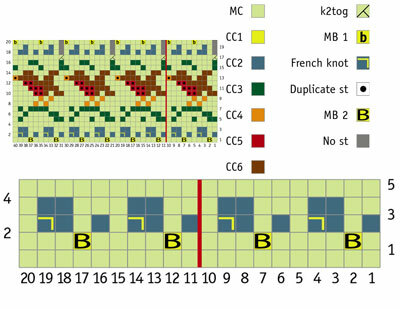 Work rows 1–31 of Songbirds Chart, incorporating decreases as indicated. Some rows of this chart call for 3 strands of yarn to be used in the same row. If you prefer, work the 3rd color in MC, then work duplicate sts as indicated on chart with the 3rd color after knitting is complete. Change to smaller 16″ circular needle and work 3 rnds in k1, p1 rib. Change to CC3 and knit 1 rnd. Work 1 rnd in k1, p1 rib. BO in patt. Work French knots and duplicate sts with tapestry needle and yarn colors as indicated on chart. Graft underarm sts using Kitchener st.
Weave in ends and steam lightly to block.